Last year our pecan tree had a bumper crop (enough to last us into this year as well). We had bags of them lying in our home, and we were ever in search of new ways to incorporate pecans into our cooking. While hamantaschen are traditionally filled with prune or poppy-seed filling, fruit and chocolate fillings have become popular. 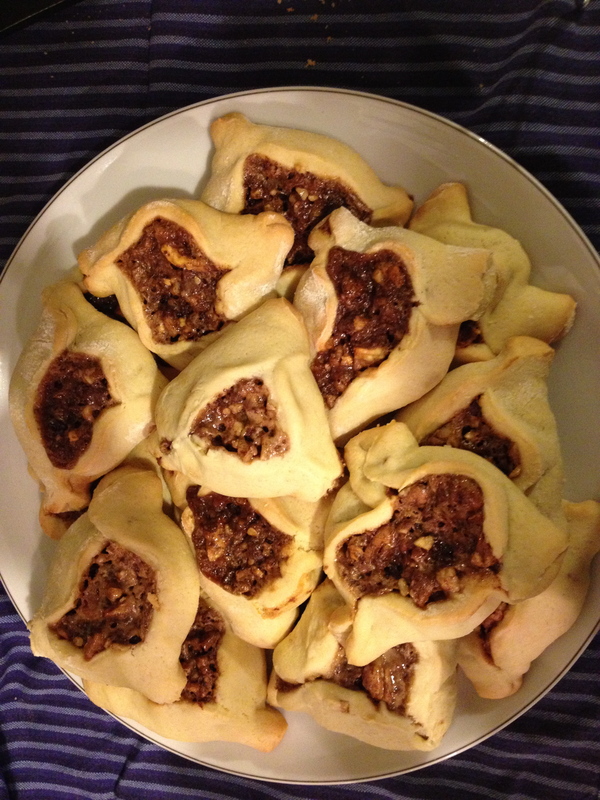 For years our family filled the hamantaschen with chocolate chips. Adding pecans seemed like a natural extension. 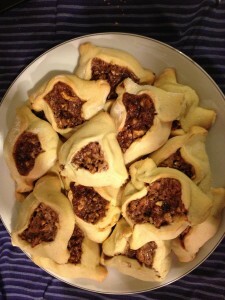 Prepare a cookie-style hamantaschen dough. For years I have relied upon the cookie style recipe published by Gloria Kaufer Green in The New Jewish Holiday Cookbook. It uses vegetable oil. This has the benefit of making the dough inexpensive and also easy to work with. I always add a teaspoon or so of finely ground lemon or orange zest. Place the dough in the fridge to harden. Don’t rush this step. I like to flatten the dough into several discs before placing them in the fridge, as this makes the rolling out stage easier. Prepare a pecan pie filling, with the addition of chocolate chips. I based mine on a pecan pie filling found in the Joy of Cooking. Half the recipe was sufficient. When given a choice, I used dark brown sugar and dark corn syrup. The recipe called for toasting the pecans, which I recommend. I added the pecans to the mixture immediately after I toasted them, which warmed up the filling and made the chocolate chips melt slightly, to a delicious, gooey effect. Prepare the dough to be filled. Roll out the dough until it is between one-quarter and one-eighth of an inch thick. Either use a clean, floured surface or place the dough between two sheets of waxed paper. Use a three-inch circle cutter (or a drinking glass that is as close to the size as you can get) to cut out as many circles as you can. Roll extra dough into a ball and repeat the process until almost all the dough has been turned into circles.